"Hydrogels eliminate the need for the bait stations. The hydrogels are applied on the ground where the ants forage. Once an ant finds the hydrogel, it drinks from the surface of it. It then goes back to its nest and shares the toxic liquid with nest mates. 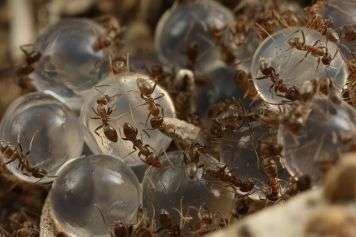 The ants also create a trail to the hydrogels that their nest mates will follow," Tay said. The article, published in Pest Management Science, is called "Development of an alginate hydrogel to deliver aqueous bait for pest ant management."